Since you cannot delete a medical alert that is attached to any patients, you can inactivate a medical alert that is no longer needed to prevent it from being attached to patients anymore. Inactivating a medical alert does not affect patients that have that alert attached to their records. Additionally, you can reactivate a medical alert that was inactivated previously. On the Settings menu, under Patient Care, click (or tap) Medical Alerts. The Medical Alert page opens. 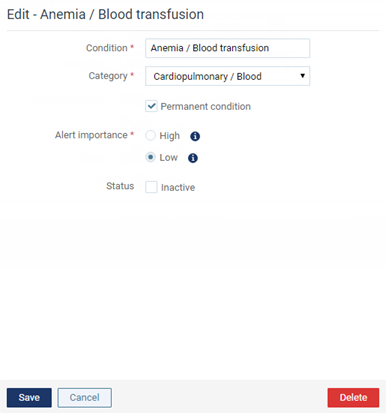 On the Medical Alert page, under Alert List, begin typing an alert in the search box, continue typing as needed to narrow the search results list, and then select a medical alert. 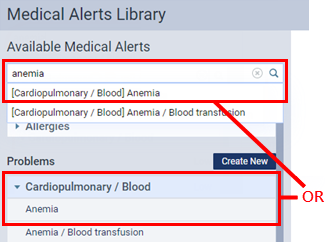 Alternatively, you can locate and select a medical alert in one of the categories (which are expandable and collapsible sections). The options for editing the medical alert become available. To inactivate the medical alert if it is active, select the Inactive check box. The medical alert will no longer be available for selection when you are attaching medical alerts to patients. To reactivate the medical alert if it is inactive, clear the Inactive check box. The medical alert will now be available for you to attach to patients.